Last February, I accompanied a local woman from the Rangpur district in Bangladesh to the sandbars – called char – to see how a new cultivation technique had transformed lives in the area. Srimoti Alka and I started our journey by boat to the sandbars. On reaching our destination we met Hoshne Ara, the proud owner of a large pumpkin patch. That year she had built approximately 200 pits, and planted three to four seeds in each. It had been about four months since the initial planting, and she had another month to go before her crop would be ready. Then she would have anywhere between one to two thousand pumpkins to sell on the market. It is not an easy job, and the pumpkin patch requires a lot of care. She has to visit the area several times a day to take care of the plants. They require watering several times a day, and she looks over the leaves closely for pests or potential diseases. Nevertheless, she seemed profoundly happy. Even in the extreme heat of the noon day sun, she had a smile on her face. Her joy came from the fact that just four years ago, she was literally homeless and landless. A series of floods in the Teesta had swept away her house and her farm. She had to go to a local shelter. Then she started cultivating pumpkins on sandbars, and has not looked back since. 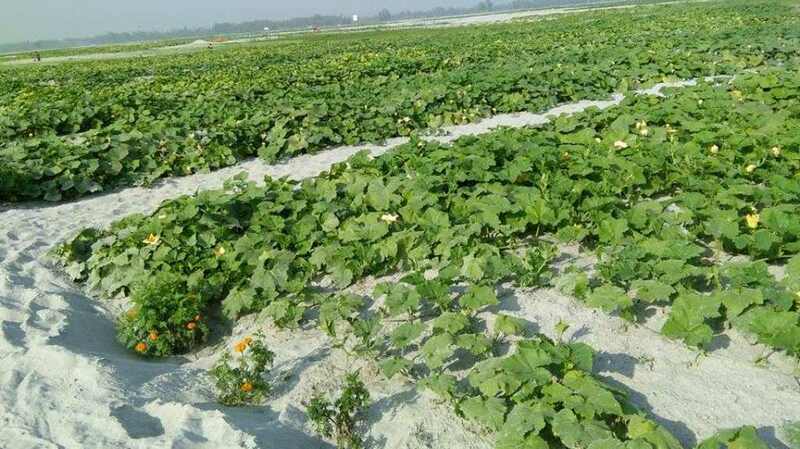 Her story is similar to that of hundreds of thousands of Bangladeshis who have been encouraged to plant pumpkins on the sandbars as part of an innovative poverty alleviation approach in the country. The sandbars are government land under the law. Prime Minister Sheikh Hasina has publicly praised the Pathways From Poverty Project, a part of the Economic Empowerment of the Extreme Poor (EEP) programme – a collaboration between the United Kingdom’s Department of International Development (DFID) and the Government of Bangladesh. EEP has worked to help more than a million people living in extreme poverty, about half of them women, earn their livelihood. This project has become even more critical as climate change and variations in river flow have left poor farmers unable to pursue traditional cultivation methods. Pumpkins, and other crops that need little water, may be a larger change for Bangladesh than just poverty alleviation. All along the Teesta farmers are having to move away from cultivating boro – the traditional rice crop grown from November/December to May/June. The Water Development Board (WDB) is unable to provide irrigation water to their boro fields as water flow in the Teesta river falls drastically during the season. The newly set target covers only four upazilas (sub-districts) of Nilphamari-Dimla, Jaldhaka, Kishoreganj and Sadar. Farmers said they can either cultivate multiple crops that need less irrigation, or cultivate boro using costly diesel-run pumps, in the remaining 57,000 hectares. But even in the areas getting water, farmers are shifting crops. In a recent visit to Sadar upazila beside the Dinajpur branch canal, it was found that many farmers have cultivated wheat, maize, pumpkin and other crops on their lands, instead of boro. This was despite the fact that this area was likely to get irrigation water as per the WDB’s new target. This is the seventh in a special series of reports by women journalists, done in partnership with ICIMOD, showing how vulnerable communities innovate and adapt to the impacts of climate change. The Himalayan Adaptation, Water and Resilience Research (HI-AWARE) is a research consortium that has carried out scientific and participatory research to better understand the impacts of a changing climate in the region. As part of this project, HI-AWARE reached out to women journalists across the region to capture local experiences – from high in the icy mountains to the sandy plains. The stories that emerged are now being published on thethirdpole.net as part of a special series to be published over the next few months. From farming silt on the banks of the Gandak, to harvesting water through artificial glaciers in the mountains, these stories capture the innovative adaptation strategies people are using and that can serve as lessons for communities elsewhere.